"Hey guys! A quick recap of yesterday for you. 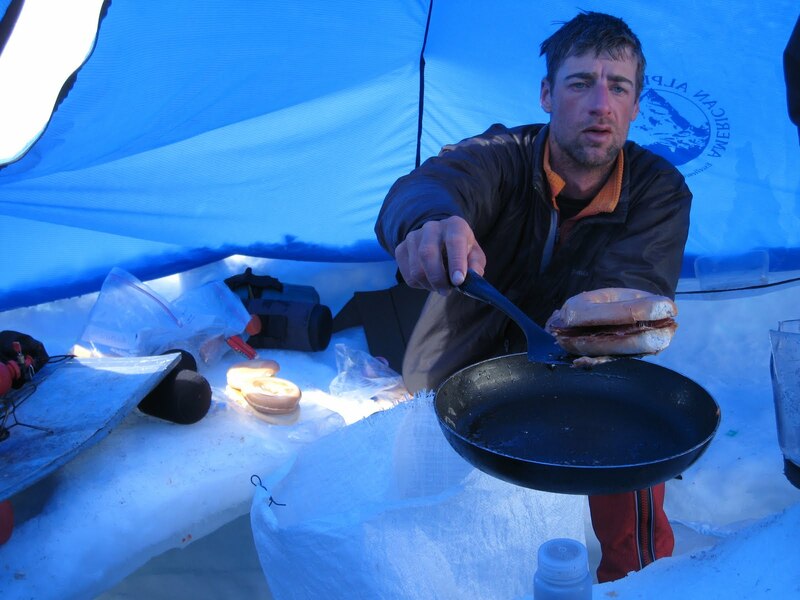 We awoke in base camp to light snow showers and had a restful morning waiting for the rest of the team to arrive. We took the time to enjoy some Denali sandwiches, as we fondly call them around here. The sandwich is made up of English muffins, sausage, and cheese, all fried up in a healthy serving of butter. It may sound bad for you, but up here it seems like just what the doctor ordered! We also had some scrambled eggs on the side. After breakfast we just relaxed in the afternoon, until Aili, James, and Iza flew onto the glacier. We spent the rest of the afternoon getting to know our new team mates, bonding, and practicing sled and rope rigging. At night, we ate tons, and tons of burritos, in preparation for the big moves ahead. This morning we woke up and enjoyed some delicious homemade cinnamon rolls that our new teammates flew in for us! We left camp around 10am this morning (after digesting) and are currently about an hour outside of Camp one. It is an absolutely bluebird day, without a cloud in the sky. A perfect day for movement, with temperatures balancing out the intensity of the sun. Traveling on the lower Kahiltna is actually going quite quickly, as the glacier is well filled in, making travel relatively straight forward. Tonight we will cook up some garden burgers, and then get to bed early as we hope to cache at 10,500 feet tomorrow. Well that's all for now. I wanted to say that I am excited for all the new American Alpine Institute guides going through guide training, and that I wish them well! [thanks Kurt!] We will talk to you guys again soon."